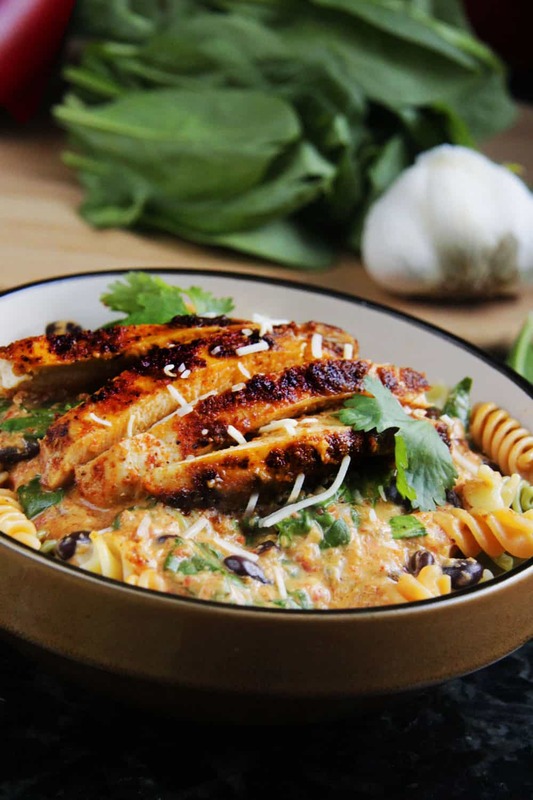 This TexMex Roasted Red Pepper Pasta is smothered in a creamy roasted red pepper sauce spiked with fiestalicious spices and bursting with chipotle chicken, spinach and black beans! 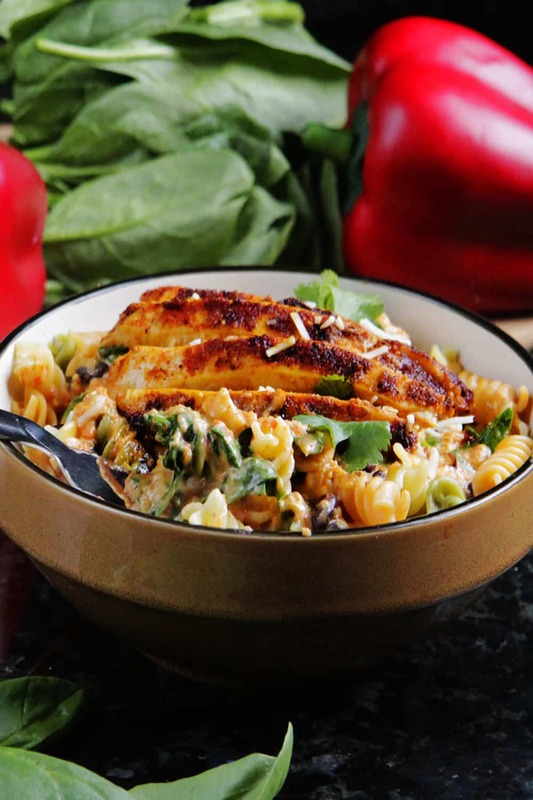 TexMex Roasted Red Pepper Pasta is about to become one of your favorite pastas in. the. world. 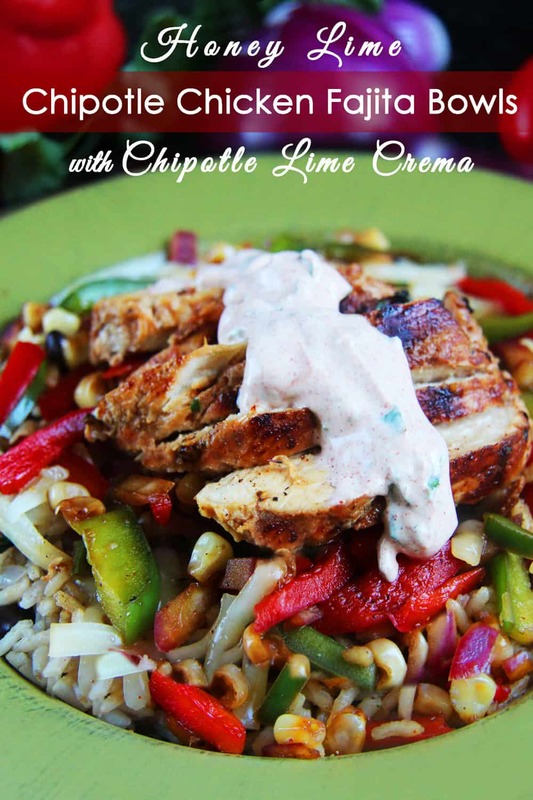 It’s completely customizable – add chicken, add chorizo, add sausage, add any veggies you want – or don’t! Because this pasta my friends, is all about the luscious, multi-dimensional roasted red pepper sauce! I wanted to save one of my favorite pastas for today because today is my 3 month blogging anniversary! I have been having so much fun sharing my craving creations with you, and am so honored you are not only visiting my site but trying my recipes! Every time I get a comment that you have tried and loved a recipe of mine, I a big smile stretches across my face and my heart- so thank you!!! After I made my Creamy Spinach and Egg Quiche Taquitos with Spicy Roasted Red Pepper Feta Dip – I couldn’t stop fantasizing of all the different ways I could use roasted red peppers. While for the quiche taquitos I used jarred roasted bell peppers (because as I mentioned in the post, we had an entire Costco size jar of them to use up! ), but for this pasta sauce, I roasted my own, and they were doubly divine! If you have never roasted bell peppers, before, its a cinch! You simply broil them for 10-minutes or so, place them in a paper bag and allow them to steam, and then you peel off the skins. Cinch, right?! Similar to how I added a Mexican flair to my roasted red pepper feta dip, which is a traditionally Greek dip, I knew I wanted to do the same with this roasted red pepper pasta sauce, which is traditionally more Italian. So I spiced my TexMex Roasted Red Pepper Pasta sauce with chipotle chile powder, smoked paprika and cumin making it one of my all time favorite pasta sauces! Not only is it super flavorful, it also boasts a fresh, smoky-sweet pepper flavor from the freshly roasted bell peppers AND its crazy creamy! It doesn’t get much better than this. Possibly any better than this! I also added black beans and spinach to the sauce for extra dimension. They perfectly compliment the roasted red pepper pasta sauce without compromising the creamy texture. Black beans and spinach never tasted so good! 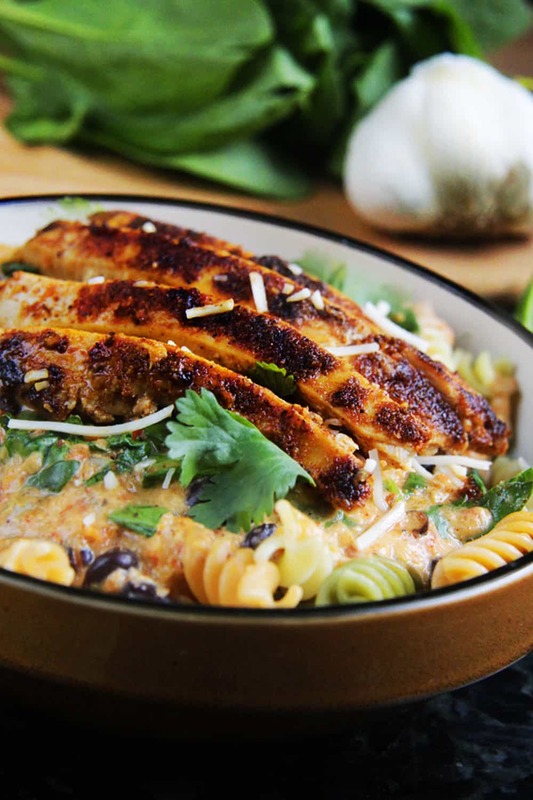 To completely knock the socks off this TexMex Roasted Red Pepper Pasta dish, I added blackened chipotle chicken. 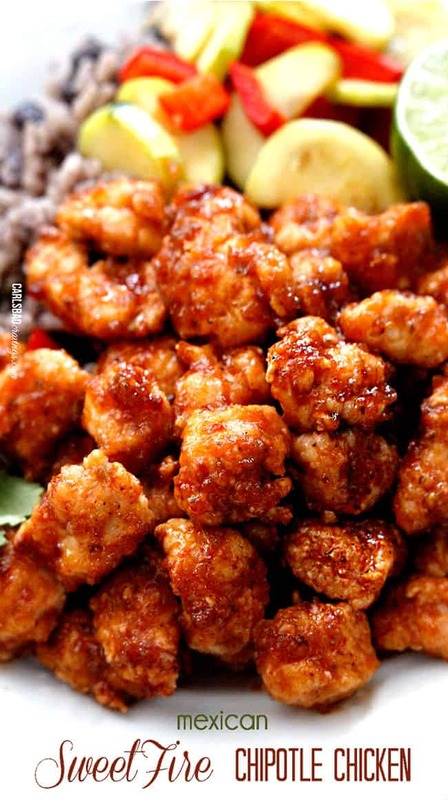 Its rubbed in spices and then cooked to juicy, flavorful heaven. After you make this chicken, you are going to be wondering why you don’t make chicken like this for every dish?! 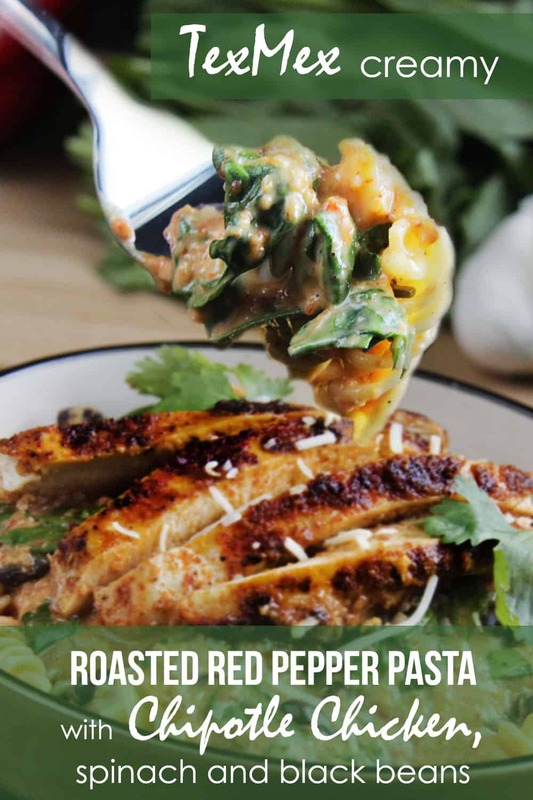 Want to try this TexMex Roasted Red Pepper Pasta Recipe? 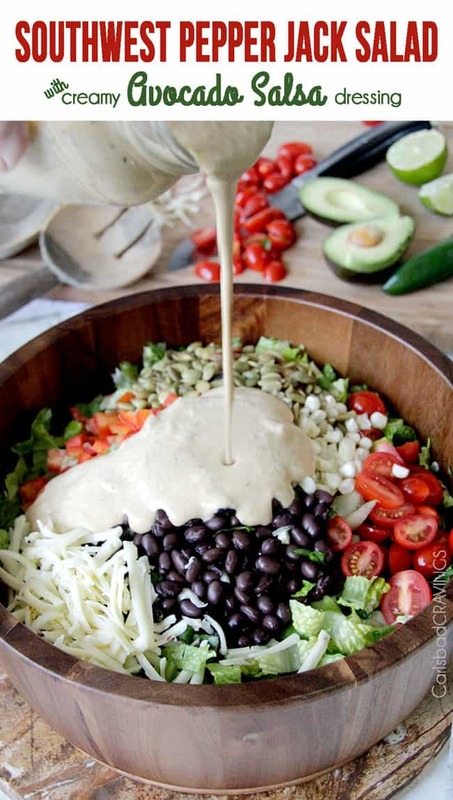 Pin it to your MEXICAN, CHICKEN, PASTA or DINNER BOARD to save for later! In a small bowl, whisk chicken rub ingredients together and rub evenly all over chicken breasts. Set aside. 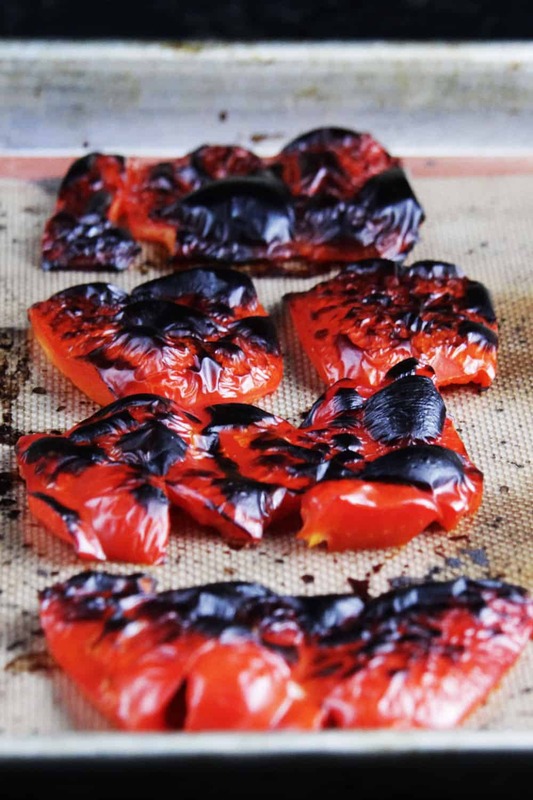 Roast red peppers by placing the halves, skin side up, on a lined (foil/ parchment paper) baking sheet and press them flat with your hand. Broil on the top oven rack for 10-minutes, or until the skins are mostly black. (You may need to rotate your peppers half way through to char evenly.) Once peppers are blackened, place them in a paper bag or freezer bag, and close tightly, allowing them to steam while you prepare the chicken or for at least 10 minutes. Meanwhile, begin cooking pasta according to package directions in generously salted water. Heat large non-stick skillet over medium high heat. Once very hot, add chicken and cook, undisturbed for 3-5 minutes, or until nicely blackened on one side. Turn chicken over, cover, and reduce heat to medium. Cook for approximately 5-8 more minutes (depending on thickness of chicken), or until chicken is cooked through. Remove to a cutting board and let rest 3-5 minutes before slicing. After peppers have been steaming at least 10 minutes, peel the outer charred skin off with your hands – it will slip right off. Add bell peppers, onion and garlic to a food processor/blender and pulse until smooth. Add red pepper puree to the same skillet your chicken was cooked in (there should still be some oil left – if not heat 1 tablespoon olive oil) and saute for 5 minutes over medium heat. Stir in 1 tablespoon flour and cook an additional minute. Whisk in chicken broth and bring to a simmer. Add spices listed under "Roasted Red Pepper Pasta Sauce." Simmer until sauce is slightly thickened, 3-5 minutes. Stir in cream cheese until smooth. Add black beans and cook until heated through, then stir in spinach. Add pasta to the sauce and stir until well combined. 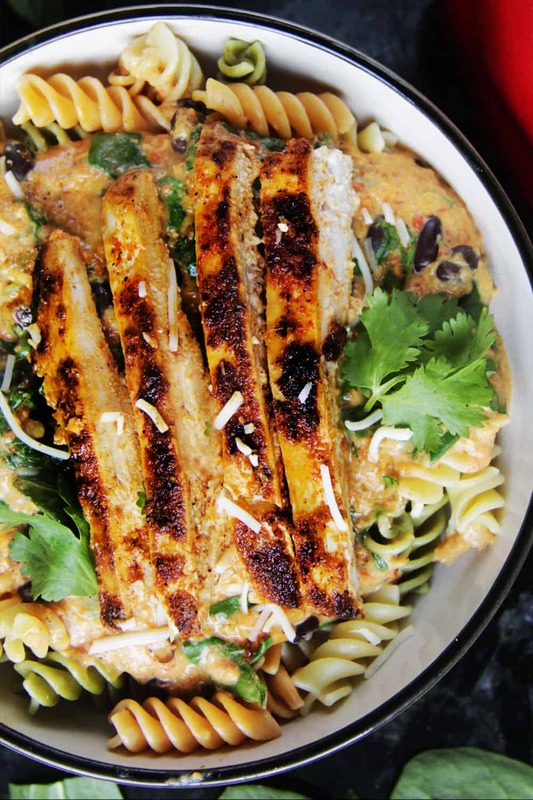 Top individual servings of pasta with chicken and cilantro. Such beautiful photos. I could almost smell it!! Love it! Thank for sharing. this is my kind of recipe!! i can’t wait to try it! Thanks so much Becky! I think you will love it :)! Love, love this dish. Your photos are gorgeous! Thank you so much Mary Ellen! Enjoy! Thanks so much Shelby! I have been cooking forever but have learned more about blogging and photography in the last 3 months than I ever have! Its so fun! Gorgeous pasta! I am at the 4 month blogging mark today!. Your photos are fabulous. Congratulations! Isn’t the learning curve crazy! Its a lot of fun, a lot of work and rewarding all at the same time. Keep up the awesome work! Great recipe! Will forward this to my mom, she’s the better cook. Thank you! Came over from #Bloggers’CommunityonFB… and now I’m hungry. Recipes like this are my achilles’ heel! I LOOOOVE pasta. Yum. Me too, especially creamy pasta! Thanks for stopping by! I bet this is awesome! Thank you for sharing! You are most welcome Starla, enjoy! This looks so amazingly good! I will have to try this out soon. My mouth is watering! Thanks so much Holly! I am excited for you to try it because I know you will love it! Thanks so much for stopping by! I have made this and it is soooo good! We’re having company over this week and I am making this for them! We love it! This looks amazing!! Would you recommend substituting jarred roasted red peppers to save time? Do you think you can freeze the sauce? Hi Amanda, yes I think this sauce would freeze very well. Enjoy! Yay for a winner! Can’t wait to hear what else you are making! i hope they are all winners :)!!! I ran across this recipe via Pinterest, and I have to say, this is now one of my favorite recipes! I used 2.5 pounds of chicken, and after mixing the chicken into the sauce, I realized that it wasn’t enough. I ended up having to triple the “honey” sauce, but still stuck to using 16 oz of Salsa Verde. I marinated the chicken in double the sauce, and used a third round + the Salsa Verde to cover. It made 10 enchiladas, that are amazing!! I am so happy you loved it so much to be a new “favorite” – yay! and I’m glad you were able to make it come out to your liking by doubling the “honey sauce. I hope you find more recipes to love here! thanks Monica! 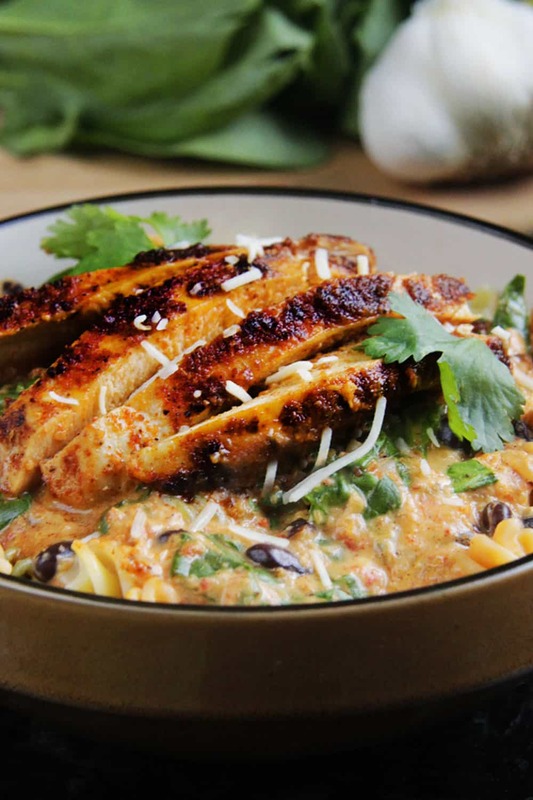 I made the Texmex creamy roasted red paper pasta with chicken and it was outstanding. My husband and I loved everything about this dish! Thanks!! YAY! I am so happy you both loved it Debra! It is one of my favs so I love hearing when others love it! THANK YOU! Jen, I guess this is an old recipe so I hope you get this. Am wondering if I use the jarred red peppers would I use the ones in oil and if so, would I also use the oil? Also, about how much would I need? YAY! I am so excited you are going to make this recipe! It is an oldie but it’s so good! I would use one 12 oz. jar of roasted red peppers. You can use the ones in oil but I would be sure to rinse them very well. I hope that helps!